Article: "Top 10 terrific traits of people with autism"
After this morning's rant, it's time for a happy post :). I absolutely love this article and have seen many of these positive traits in my own sons. They choose their friends based on who is nice, not who is "cool," what they wear, or what they look like. When they tell me they love me, it just happens to be what they were thinking about at that moment in time (which is so cool IMO), not because they think it's what I want to hear (they aren't particularly interested in what I want to hear, lol). They feel free to be themselves and don't care what anyone else thinks. And they all have amazing memories, I could write a whole separate post about all the cool things they can remember (maybe I will!). And so, here's the article, with a link to the source. If you're sick of hearing about all the "deficits" challenging people on the autism spectrum, join the club! But for every down side to autism, there seems to be a positive -- an unusual trait that rarely appears among the "typical" community, but shines out among folk who have Autism. These plusses are well worth celebrating. We all claim to value the truth, but almost all of us tell little white lies. All, that is, except people on the autism spectrum. To them, truth is truth -- and a good word from a person on the spectrum is the real deal. How often do typical people fail to notice what's in front of their eyes because they're distracted by social cues or random chitchat? 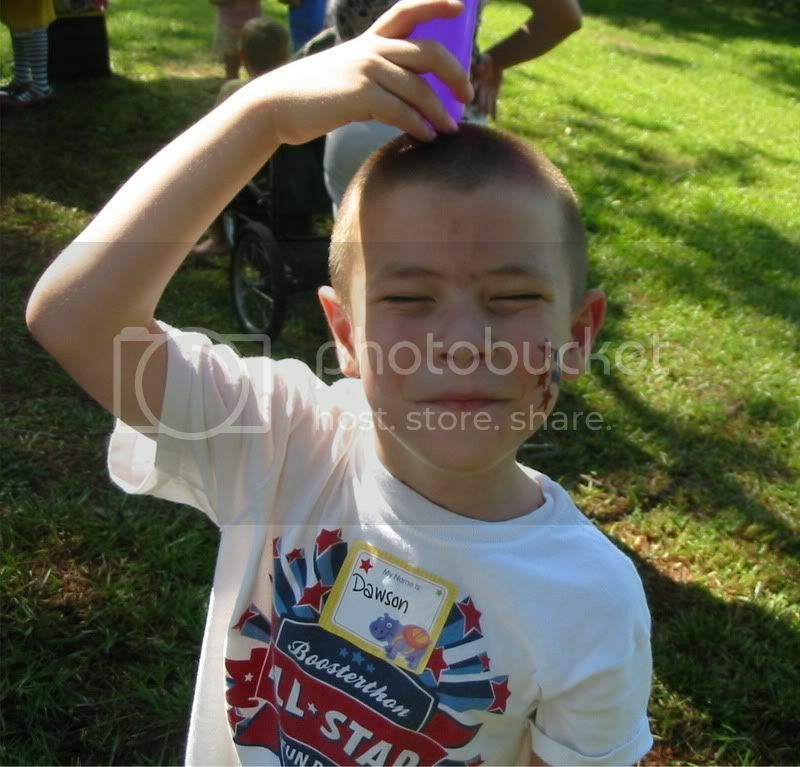 People on the autism spectrum truely attend to the sensory input that surrounds them. Many have achieved the ideal of mindfulness. Who's fatter? Richer? Smarter? For people on the autism spectrum, these distinctions hold much less importance than for typical folks. In fact, people on the spectrum often see through such surface appearances to discover the real person. Of course, not all people with Autism are alike. But many are truly passionate about the things, ideas and people in their lives. How many "typical" people can say the same? If you've ever bought a car, played a game or joined a club to fit in, you know how hard it is to be true to yourself. But for people with autism, social expectations can be honestly irrelevant. What matters is true liking, interest and passion -- not keeping up with the Joneses. How often do typical people forget directions, or fail to take note of colors, names, and other details? People on the autism spectrum are often much more tuned in to details. They may have a much better memory than their typical peers for all kind of critical details. Of course, this is not universally true -- but in general, people with autism are far less concerned with outward appearance than their typical peers. As a result, they worry less about brand names, hairstyles and other expensive but unimportant externals than most people do. Who was that woman, and why were you looking at her? I know I TOLD you I didn't mind if you went out, but why did you believe me? Most people with ASD don't play games like these -- and they assume that you won't either. It's a refreshing and wonderful change from the Peyton Place emotional roller coaster that mars too many typical relationships! Most of the time, if a person on the autism spectrum tells you what he wants -- he is telling you what he wants. No need to beat around the bush, second guess, and hope you're reading between the lines! For some of us neurotypicals, having a person with ASD in our lives has had a profound positive impact on our perceptions, beliefs and expectations. For me, at least, being the mom of a son on the autism spectrum has released me from a lifetime of "should" -- and offered me a new world of "is." News: "Autistic toddler kicked off airplane"
You may have seen this story in the news the other day - a mother and her 2-year-old toddler, who has autism, were removed from a plane. My first reaction when I heard about this, aside from feeling bad for this mother and her son, was that this is the reason we don't fly. With three autistic children, two of whom are very hyperactive and all three easily overstimulated, I'd be terrified to take them anywhere near an airport. The noisy crowds alone would be too much - add in the long lines, waiting in the terminal, and the fact that pretty much everything about the airport is outside their normal routine, and it would be a recipe for disaster. I'm pretty sure we wouldn't even make it past security. That being said though, there are situations where driving is not an option, either due to distance or time / urgency. I don't know why the mother and son were flying, other than to see family, but from what I have read she had flown before without incident so she would have had a reasonable expectation to be able to do so again on this flight. Personally, when I read that their flight had been delayed 11 hours I was extremely impressed that the little boy had done so well up to that point. The airport routine is stressful for anyone (it's stressful for me and I'm an adult), much less a 2-yr-old, especially a 2-yr-old with autism. And this little boy managed to hold it together through the whole thing, including having to wait in the terminal for ELEVEN HOURS, and through the whole boarding process. Autism or not, any 2-yr-old (not to mention older kids and adults) would have been reaching the limits of their patience by then. It's no wonder he was agitated when he got on the plane. His mother would most likely have been able to help him cope, had the flight attendant not intervened and antagonized both the boy (I would have been livid!) and his mother - tugging on his seatbelt (which was probably painful to him due to sensory issues) and yelling at both him and his mother. The result was a full-blown meltdown. What I really want to write about though, is not the pilot's decision to turn the plane around (although I wonder why he felt it necessary to add insult to injury by announcing to the entire plane that they were returning because of a woman and her "uncontrollable child" - did he really think there was anyone on that plane who couldn't hear what was going on??). What is more disturbing to me about this whole thing, is many of the comments I have read in response to the story. Sadly, I am not surprised by the ignorance. But I am appalled at not only the lack of compassion but outright mean-spiritedness and hurtful nature of the comments. That's not to say there weren't sympathetic and kind comments, there were. There were some neutral ones too. But the rude and spiteful ones were many. There was intense anger and callousness directed at not only those with autism, but children in general, and the entire special needs community. I finally had to stop reading them. I have to wonder if these people are so cruel in person, or if the anonymity of the internet has unleashed a new level of maliciousness. Either way, it is very disheartening. In many of these comments, the mother was referred to as "unfit" and "useless," and I'm not even going to repeat what some people called the little boy. Some people seem to think that the price of a plane ticket should entitle them to a quiet, undisturbed flight. Anyone who has ever flown knows that is ridiculous. Some people said if the mother just "smacked him" that would solve everything. There was disdain for the autism diagnosis, with people claiming that no one was autistic when they were kids (I beg to differ but that's another topic), as well as one who even suggested that maybe the child was autistic because his parents didn't talk to him enough. Give me a break. Aside from that there were the usual contradictory comments that "if you can't control your child, keep him home." Well, if we keep them home, how will we ever teach them how to behave in public? And don't get me started on "controlling your children." No one controls their child. Children who do not have autism or other neurological issues are hard-wired to learn action-consequence and to try to please their parents. They are hard-wired to care what people around them think of them and to behave as others do. Children with autism are wired differently. That is not to say they can't learn how to behave appropriately but it takes time. The little boy in question is only two. My kids were 4-5 years old before we got to the point where there were more good outings than not-so-good. At age 2, pretty much everywhere we tried to go led to overstimulation and a double-meltdown. People with autism often have sensory issues also. This means that the sensory input (sights, sounds, smells, etc.) that most people tune out or even find pleasant, can be stressful or even downright painful to someone with autism. At age 2, all children are still developing their communication / social skills and learning appropriate responses. Delay in communication / social development is one of the hallmarks of autism, so is it any wonder that an autistic child would have difficulty responding "appropriately" when their system is overloaded with sensory input and they are stressed out? Looking at this in the larger context of other recent news stories, it appears there is a lot of discrimination going on towards people with autism. For example, a 5-yr-old boy with Asperger's was recently voted out of his classroom at the direction of his teacher. I can't even imagine the emotional harm done to that child, as well as to the children who were forced to participate. A 13-yr-old boy with severe autism was banned from attending church. Banned from church?! Isn't that the one place where everyone is supposed to feel accepted? At one school, all of the special needs students were left out of the yearbook. Unfortunately, I'm afraid that these kinds of things have been going on for a long time, but are only recently garnering widespread focus. It is painfully obvious to me that our society has a long way to go in terms of autism acceptance. With the statistics being 1 in 150 children having autism, and 1 in 94 boys, society has no choice but to move in that direction. All I can say is I'm grateful for the people in our life and our sons' lives who are accepting. I'm grateful that my sons are MINE and were not born to any of the ignorant folks who would abuse them before they'd recognize that what they needed was understanding and a little help. I'm grateful for teachers that support them, and advocate for them when they are at school when we can't be there. As for me, I'll keep doing my part to promote autism awareness and acceptance with those I come into contact with! 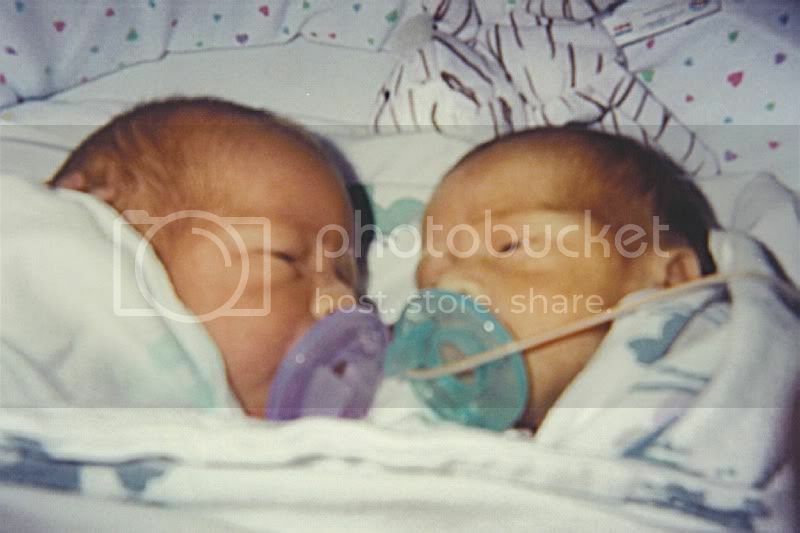 For the month of June, I decided to write a series of posts about my twins' first month of life to help raise awareness about prematurity and TTTS (twin-to-twin transfusion syndrome). This is the 7th and final post in the series. Seven years ago today, after 22 days in the NICU, we were finally able to take our baby boys home! In a way, it was a little nervewracking. I'd gotten used to having those beeping monitors to let me know everything was ok with them, so I worried about how I'd know they were ok once we got home. We'd gotten used to having the nurses around too, help nearby if we had questions. Now we were on our own.More than that though, we were soo excited to finally bring our babies home. No longer would we have to visit them every day, no longer would their cribs at home be empty. They would be home with us where they belonged. 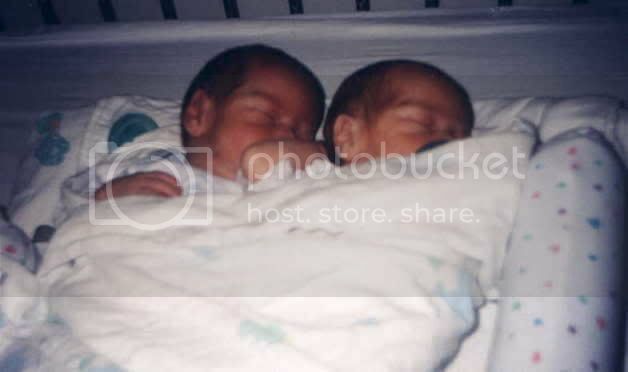 Here they are on the day we brought them home from the NICU. At that point, Cuddlebug was about 5 lbs, Bearhug about 6 lbs. They were still small and needed to eat about every 1 to 1 1/2 hrs so between feeding, burping, diaper-changing, and oh, maybe trying to fit in a little sleep here and there - they kept us pretty busy. My sons have given me some interesting answers to this question over the years - at one point Bearhug gave me a rundown of all the jobs he was going to have. On Mondays, he'd be a 1st grade teacher, on Tuesdays, he'd be "cooker man" (aka chef), on Wednesdays, a 5th grade teacher, Thursdays he'd be a train driver and Fridays, an ice cream man. He and Cuddlebug were going to own an ice cream store together, and CB would hold down the fort during the rest of the week while BH was at his other jobs. Sounds like a busy week! Today, CB was showing me his schoolwork (dh does homeschool with the boys over the summer) and one of the things they worked on today was graphing. I made a comment that I do graphs at work, so it's a good thing to learn and something he may use as he gets older. He informed me that he isn't going to have a regular job when he gets older, which kind of surprised me because we taught him and his brother a long time ago about money and that people go to work so they can make money to pay for food, a place to live, clothes, toys, etc. so they understand how that works on a basic level. I asked him how he planned to buy food and things he needs when he's an adult (wondering how long he's planning to live at home, lol) and he told me his wife will do that. As soon as he said that I knew exactly what he meant, and I was right, he said he's going to stay home and take care of his kids. Next week it will probably be something different, but I thought it was really sweet, and pretty cool that he would want to follow in his dad's footsteps. Why my blog is called "3runningincircles"
In case you're curious... here's the reason. Here's another picture I took of Cuddlebug and Bearhug yesterday, I love this one :). Cuddlebug and Bearhug were asked to clean up their rooms today, so while BH cleaned up the playroom, CB cleaned their bedroom. As I went into the bedroom to hang up their clothes, CB said to me, "Mama, did you put these slippers on the bed?" 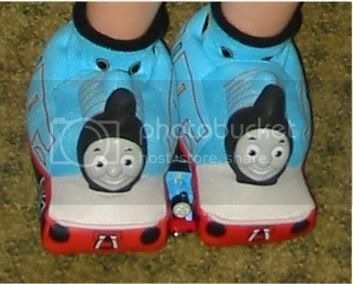 in a stern voice, pointing to his Thomas slippers. I responded that I hadn't, since I'd been busy doing laundry. "Well," he said ominously, "I hope whoever did it is ashamed of themselves!" Stifling a laugh, I told him I'm sure they are. "No, I don't think they are!" was his reply. At this point, an unsuspecting BH walked in and was met with CB the interrogator. "Did YOU put these slippers on the bed?" BH apparently knows that tone, so even though no one else was around to have done it he said "uh... no." CB ignored him and said accusingly, "You knew I was going to wear them!" I was still in the closet trying SO hard not to laugh. How could BH have known that unless CB told him? Why would it matter? Can't he still put them on just as easily? Is a pair of slippers moved 4 feet to the bed really worth all this 3rd degree stuff? Little Bitty had a meltdown today over his DVD's, namely, not being able to find them. After months of his DVD obsession and several lost and broken DVD's we slowly dwindled his "stack" until we finally hid them one day and pretended to have no clue where they were. For the most part, he has moved on to other things but sometimes he still goes to the closet where he thinks they are and asks "D-D?" Today was one of those days, and he wasn't taking no for an answer. He went so far as to break the doorknob cover off the closet door (we're in trouble if he can do that on a regular basis now) and start trying to find the DVD's himself. Unfortunately, he couldn't find any, so the meltdown began. Screaming, crying, rolling around on the floor, not a happy camper whatsoever. We're no strangers to meltdowns, so I took it in stride as much as I could, but you can only take so much of the screaming before you feel like joining him on the floor for a little rolling and screaming of your own. So, in my attempts to distract him (most of which were met with louder screams and throwing whatever I offered him on the floor), I came across a bubble gun that we'd stashed away for "emergency" use. Seeing no end in sight to the meltdown, I figured this was just the right time to break out some bubbles. Keep in mind, bubbles can be a double-edged sword at our house, because while they are great for calming down little boys in our family, the end of said bubbles can bring on an even bigger meltdown than the one you were trying to stop in the first place. So use carefully and at your own risk. But I was desperate, so out came the bubbles. I showed him and he stopped screaming and said "bubba!" Of course the bubbles quickly attracted the attention of his big brothers, who up until that point had been busy playing Mario Kart. Suddenly I had a swarm of three laughing, squealing, hopping boys all trying to get bubbles in their hair and see how many they could pop. The boys were all having such a good time, I got out my camera for a few pictures :). After several minutes of bubbles, I handed off the bubble gun to Bearhug so he and Cuddlebug could take turns making bubbles. 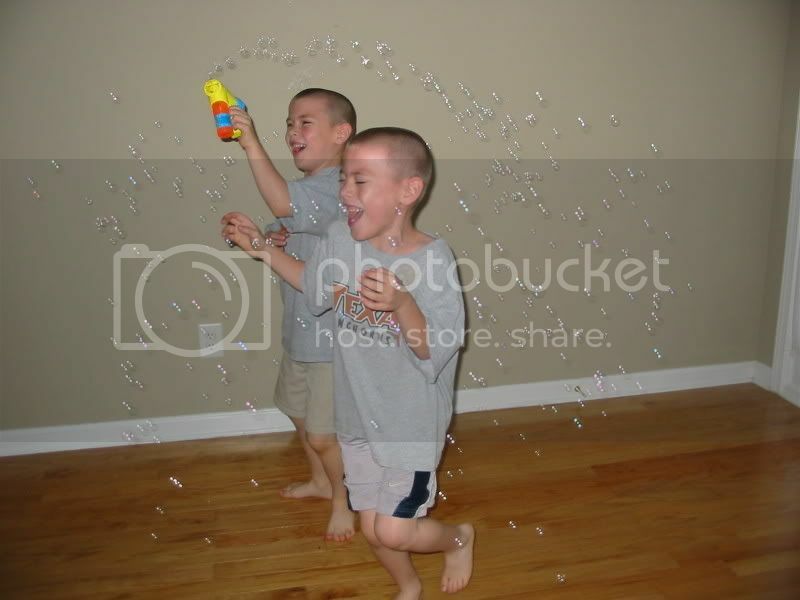 They went through the entire bottle of bubble-liquid. We wondered how Little Bitty managed to get so much food in his hair whenever he ate, and now we've figured it out... he's using his hair as a napkin. Guess it makes sense, he can't use his shirt since he doesn't like to wear one, lol. I've tried giving him an actual napkin (what a concept!) but he's not particularly interested. Why bother when your hair works just fine? Bearhug and Cuddlebug got a new video game for their birthday, which they have had a great time playing and unlocking new race tracks and characters. But I've found it interesting to watch how they play. Most of the time, BH is the one playing and CB is watching. Sometimes they play two-player, but a lot of times CB prefers to watch than to play. I asked him about it, and he said he learns how to play by watching BH. I found it really interesting, because they have always been this way. I remember when they were 5 months old learning how to roll over. BH tried and tried for over a week (maybe longer, can't remember exactly), putting so much effort into it until finally - success! Meanwhile, CB was watching him but didn't seem interested in trying it himself. But the day after BH rolled over, sure enough CB rolled over too - and got it on the first try without all the trial and error. So I guess he had been paying attention! And so it went... some things CB did first, and some things BH did first, but we noticed that the things BH did first, CB learned from watching him. I guess it works out well for them, especially since they are (generally) much more cooperative than competitive. BH likes to put a lot of effort into figuring out the most effective way to do something, he'll spend hours (not all at once) playing his video games and figuring out every little short-cut and trick to the game. CB gets just as excited as he does when he figures out something new :), and then he applies it when it's his turn to play. I love seeing their unique learning styles evolve! I know, "Naked-Pants" is a contradiction in terms, but oh well. Every time I turn around, Little Bitty is running around naked, and it's driving me crazy! He's never been a big fan of clothes, but now not only is he taking off his shirt all the time, he's figured out how to take his shorts off too, and of course the next step was the pull-ups. In a sense, I think this is a good sign, he takes his pull-up off every time he goes to the bathroom in it, so it means he recognizes when he's done his business and that he doesn't want to walk around with a mess in his pants. That's the good news. The not-so-good news is that sometimes he just takes it off for fun so he can run around going commando. The even-less-exciting news is that when he takes off a messy pull-up, he drags it around the house to bring it to us, trailing it's contents (if there are contents) as he goes. Yucky. Other times, he just leaves the messy pull-up wherever he is for us to find later (after we see him streaking across the room and go looking for it). He's also gotten quite picky about what he'll wear, now it's not only shirts (he only wants to wear Thomas) but he's decided he only likes one of the two designs that come in the pull-up package. So anytime we try to put one of the others on, he refuses to put it on and goes running to find one of the ones he likes. Seriously, I can understand wanting to wear a particular shirt, but a particular pull-up?!? I'll be glad when the potty-training kicks in and we can move on to Thomas underwear :). Little Bitty has developed a keen interest in the planets recently... he has a Baby Galileo video that he likes to watch, and his brothers have an educational toy that gives facts and figures about the different planets, which he loves to listen to over and over. He probably has the mass of Jupiter and the temperature on Mars memorized by now, not to mention how many years it takes Neptune to orbit the sun and how much a 100 lb. person would weigh on Mercury! We just happen to have a bedroom decorated with a space theme, complete with planets hanging from the ceiling and glow-in-the-dark stars. We did it for CB and BH when they were younger, b/c they liked planets too and well, we both always thought it would be cool to have a room with glow-in-the-dark stars when we were kids :). Enter Mr. Bitty... the little man who hates to sleep alone because he likes to have someone next to him (and I mean cuddled up close, not just in the vicinity) in order to sleep. Well, now that he is into planets he's decided he's totally fine with sleeping in the "space" room all by himself. He seems to find it relaxing looking at the planets and naming them off (in his cute voice, took me a while to figure out what he was saying, but sure enough he's listing planets!) until he falls asleep. Now if we could just get him to stay there all night... I keep waking up to find him cuddled up next to me in the morning. Feeling a little overwhelmed with this project... we have done homemade picture schedules for CB and BH when they were younger, and I made a whole set of picture cards (from photographs) for LB last year at the suggestion of his speech therapist. I included pictures of his favorite foods and drinks, toys, shoes (to use when going out), family members, books, potty, pull-ups, sippy, you name it. Pretty everything I could think of that he might want to say or that we might want to show him or ask him about, it was in there. The idea was to be able to show him 2-3 cards and have him choose visually what he wanted (ie. show the card for juice and milk and let him tell us what he wants by choosing the card) or to show him what's coming up next (show the card for shoes when it's time to go somewhere). Unfortunately, he was not at all interested in using them for communication, if he saw them he wanted the whole stack so he could flip through them and name them. But if I tried asking him a question and showing him a couple of cards, he threw them at me. Sigh. Ok, so that was several months ago, and he is now doing pretty well at using the cards in school and speech therapy. So I'm thinking it's time to try again with setting up a picture schedule and some picture cards for communication at home too. It's just such a daunting task! I've found a ton of sites where thankfully I can print out picture to use for free and then laminate them. But there are sooo many words and ideas to choose from. Obviously we need to start simple, so I need to figure out what are the most important ones to start with and go from there. Unfortunately the cards I made him before are destroyed so we're starting over. That's ok b/c I think the ones from school and speech are the ones w/ cartoon-like drawings rather than photos and apparently he likes those better. If you have any suggestions, please leave a comment. Otherwise, wish me luck!! 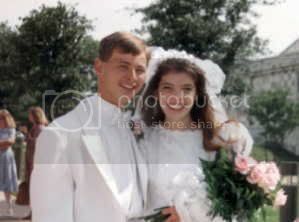 It's been an interesting 15 years to say the least... we started out as married college students, living in a basement apartment (ok, that was after 2 months living in the roach motel, but I'm still trying to forget about that!) and working as janitors at school on the 3am-7am shift for minimum wage. Over the years, we went to lots of football games and dollar movies, we got better jobs (thankfully! ), and moved around a lot. We adopted three ferrets, eventually finished school and started a family. We got the shock of our lives when we learned we were going to have twins! We experienced the roller coaster of the NICU when they arrived 6 1/2 weeks early, and the joy of sleepless nights trying to figure out a good routine for keeping preemie twins fed, happy, and asleep for any length of time. Three and a half years later we welcomed our third child into the family. We learned all about autism as our twins, and later our youngest, were diagnosed on the spectrum. So here's to a lot more eventful (or maybe just calm, that would be great too!) years to come! 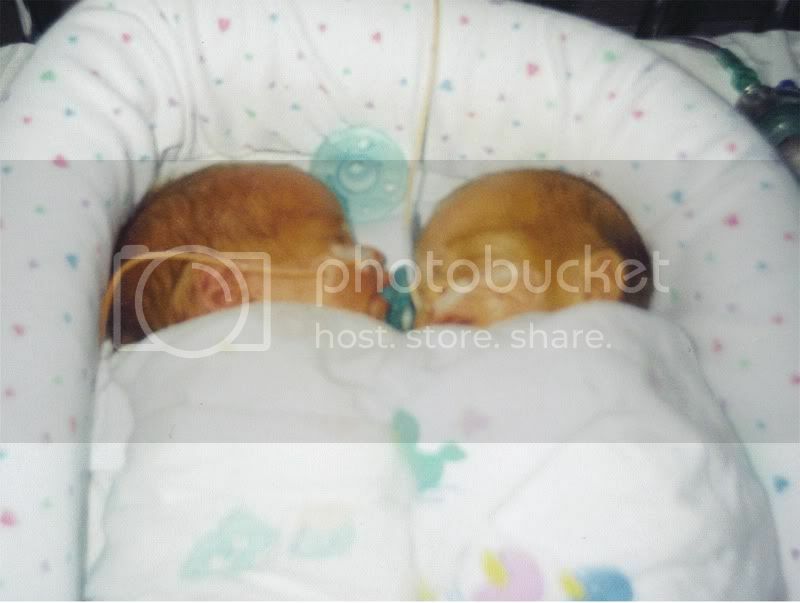 For the month of June, I decided to write a series of posts about my twins' first month of life to help raise awareness about prematurity and TTTS (twin-to-twin transfusion syndrome). 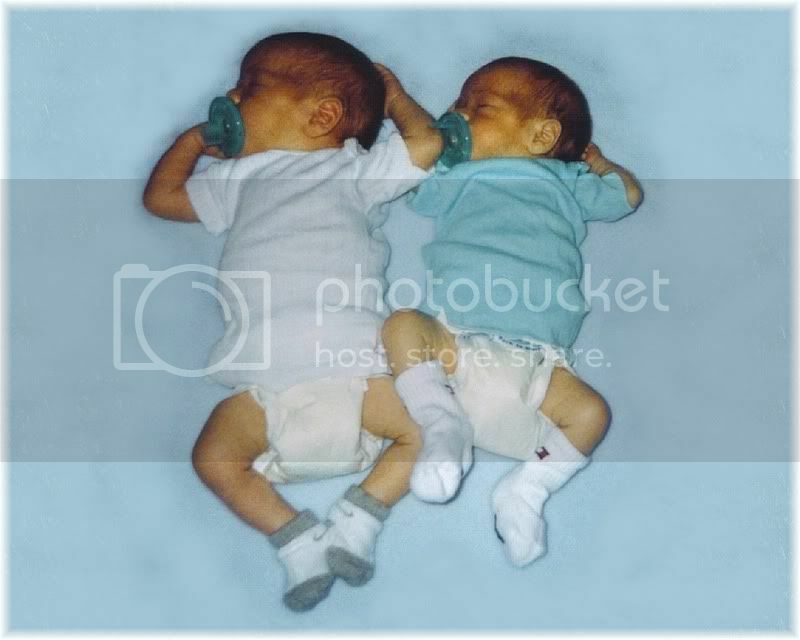 Seven years ago today, Bearhug and Cuddlebug were finally able to co-bed in the same crib together in the NICU. They seemed much happier to finally be together again. They both still had their feeding tubes in... sometimes they'd get their arms out of their swaddled blankies and pull each other's feeding tubes out. Talk about working together :). It's been a digga digga morning... my twins are very verbal so this isn't the bulk of their vocabulary like it was when they were younger, but I think it's cute that when they're playing I can still hear them either saying or sometimes singing "digga digga digga... digga digGAH..."
As for my little one, he does this too, although he's not very verbal yet so we hear a lot of digga's from him. I like his happy digga's, but it makes me sad when he's upset and the only way he can express himself is with a frustrated "di-GUH di-GUH di-GUH" (although it's better than his screaming fits). Who would have thought such a simple phrase that doesn't really have any express meaning to the outside world could be used to say so much? I've been going through all our home videos and transferring them from the tapes to our computer so I can edit them and make videos to share. 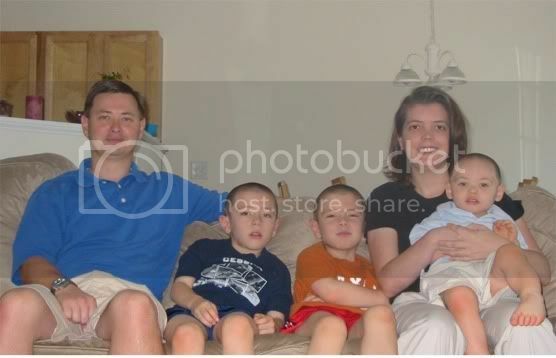 I've been watching the ones of Cuddlebug and Bearhug when they were about 18 mos old... this was long before we knew they autism. I can hear myself on the tape saying "'Cuddlebug'... 'Cuddlebug'! look over here... 'Cuddlebug'!" and he's completely oblivious. I'd forgotten just how nonresponsive he and his brother could be. At the time we didn't realize how out of the norm it was, I remember someone from church telling me she thought we should have their hearing checked b/c she was afraid they were deaf. I kind of blew it off and said (in as nice a way as I could), "No, they're just ignoring you... don't feel bad, they do it to us all the time." They still do this but it's gotten better. But wow, watching him was like dejavu of where little brother is now... I can stand right next to him screaming "LITTLE BITTY!!" and he doesn't even flinch. But I know he can hear me just fine b/c he's had his hearing tested, and b/c he can hear his Thomas toys from a mile away, lol :). Seven years ago today, after 8 long days of waiting for him to be stable enough, I was finally able to hold my Bearhug for the first time! He was so precious and I was so happy to be able to finally cuddle with him. He had some issues with his heart that we were watching, at that point the dr's didn't know if he'd need surgery or if it would resolve on its own (thankfully, resolved on its own but he had to be seen for follow-ups by a cardiologist periodically for the first 9 mos to be sure everything was ok). Now that both babies were able to be held, I even held them together sometimes, with the help of the nurses. What a joy! After 7 1/2 mos pg w/ my precious babies it had been so hard to lose that closeness after they were born, it probably sounds weird but I finally felt "whole" again when the three of us could cuddle together. The boys were both still under phototherapy lights for much of the time due to jaundice. At some point (don't remember the exact day) they had been taken off the IV's and given feeding tubes (through their noses into their stomachs). They weren't able to nurse yet so I was still attempting to pump. I had milk supply issues (that's a looong story for another post) but they got all the milk I was able to get - it was given to them through their feeding tubes along w/ special preemie formula. 1. unreasonably obstinate; obstinately unmoving. 2. fixed or set in purpose or opinion; resolute. 3. obstinately maintained, as a course of action. It's not like I don't know where he gets it from (me, lol), but my little guy can be sooo stubborn! I know this will be a good trait in some ways as he gets older, otherwise known as "committed" or "persistent," someone who knows what he wants and goes for it, and doesn't back down or allow obstacles to sway him. What has autism done for you? It has taught me to appreciate every accomplishment, no matter how "small"
Thanks to my boys and their obsession with everything Thomas, I know all the Thomas & Friends trains, their numbers and colors, and lots of Thomas songs (but I'm not allowed to sing them, the boys get annoyed when I try to sing along). My precious babies, time goes by so quickly! I look at you now, such big boys, and it's hard to imagine how tiny you once were. I feel so blessed to be your mom. My life was forever changed when the two of you came into it! From the days of talking to you and playing music in my car when I was pregnant with you, to trying to figure out how to feed both of you fast enough to keep you happy while still having some cuddle time for each of you, to chasing you when you ran off in two directions, to watching you become big brothers and how sweet you were to "your baby", to seeing you off to preschool for the first time, and now watching you continue to grow and develop, learning new things every day! I am so grateful for you and proud of the young men you are becoming. You are both so kind to everyone and I love your sense of humor! I love you all day, every day - even at night, even in the morning, even in the afternoon, even in the middle of the night, and I always will!! Happy Birthday Cuddlebug & Bearhug!! We managed to hold them off for a while but then it was present time. They opened everything up, with Little Bitty following along and checking out the things they'd already opened. The first they all wanted to play with was the new Thomas trains, all three grabbed those and ran upstairs to play. A while later they came back down to check out some of their other presents. We let them relax and play all day until it was time for the party. At the party, four of their friends came, so there were 7 kids total. All the kids had a great time running around and playing, climbing, sliding, etc. By the time playtime was over and it was time for pizza and cake, everyone was tired and ready to go eat. It was such a great day overall. You never know sometimes how these things will go, and I'm always nervous when we plan something out of the ordinary, even if it is for a special event. Our kids are so easily overstimulated and so often the things that are fun and exciting for most kids are just overwhelming and stressful for them. We tried to keep it low-key and made sure they were familiar with the place first, but you just never know. Anytime we have a successful outing / get-together it is something to be excited about :). 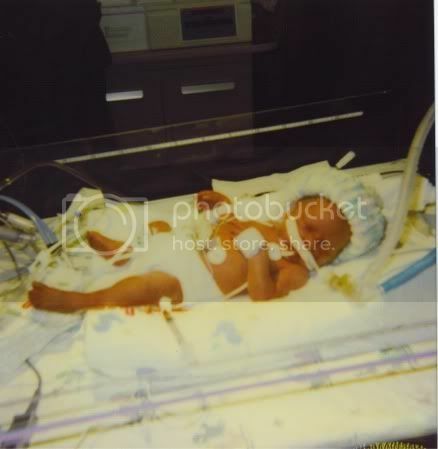 Seven years ago today, I made my way to the NICU again to visit my babies, who were 2 days old. I asked when I'd be able to hold them, and they said I could go ahead and hold Cuddlebug for a few minutes. I cried, I was so happy. The nurse helped me gently lift him out of the isolette, and showed me how to keep the monitor wires from getting tangled up or pulling off. I only got to hold him for a few minutes that first time, but I loved finally getting to cuddle with him! Bearhug was able to "graduate" from the respirator to a c-pap. He wasn't stable enough to be held yet, so I spent some time sitting with him and letting him hold my finger. Seven years ago today, I woke up in the morning alone in my room. Dh spent most of his the day in the NICU with the boys. A nurse brought me a card with some polaroid pics of the boys. Because of the meds they had me on (due to pre-eclampsia) I had to stay in bed for 24 hrs after delivery, so I couldn't go see them yet. Finally, late that night, I was wheeled down to the NICU to see my babies for the first time since delivery. They were beautiful, but they looked so small and fragile. It was hard to see them hooked up to so many machines and monitors. They both had respiratory distress. Bearhug was on a respirator at first; Cuddlebug could breathe but needed a small tube of oxygen underneath his nose. He was in an isolette. They were both under phototherapy lights due to jaundice (with the little shades that look like sunglasses). They were both on IV's, and at that point neither of them were stable enough to be held, which was really heartbreaking. I was able to hold BH's hand (really it was letting him hold my finger, his hands were so small) , and they let me open the little door in CB's isolette for a minute so I could do the same with him. I left a CD in the NICU for the nurses to play for them, with music that I'd played while I was pg with them. I hoped that it would be familiar and relaxing for them. Seven years ago today... I was wheeled from my hospital room to the perinatal specialist for another sonogram, and got back just in time for dinner. Only I was so lethargic I literally sat there staring at the plate for an hour, willing my hand to move to pick up the fork and eat a bite. And what do ya know, turns out it was actually the first good meal I'd had in the hospital, so I was looking forward to eating the rest. No such luck... nurse came in after just that one bite and said no more food for me, they're delivering my babies tonight. My dr had wanted to try to wait a couple more days, but my bp had spiked again (~165/110) and apparently the dr that did the sonogram saw something that concerned him. It was about 6pm. From that point on it was controlled chaos as they started all the preparations to get me ready for a c-sec. They gave me a massive dose of mag sulfate to prevent seizures (from pre-eclampsia possibly going into full eclampsia), and I called dh and told him to get to the hospital NOW. Thankfully he got there before they did the epidural. I don't remember all the details, they said the c-sec would be 10pm that night, I think to give the drugs time to work before we delivered. Cuddlebug was delivered first, at 10:31pm. I remember the dr holding him up over the shield so I could see, then they checked him, cleaned him and brought him over to me. It took a couple more minutes to deliver Bearhug, he was hiding in my rib cage and they had to pull him out by the heel of his foot until they could reach to lift him out. Bearhug was born at 10:33pm. They held him up very briefly. A nurse brought Cuddlebug over, all clean and wrapped up and held him by my face so I could give him a kiss and talk to him. He was so tiny precious! Then she took him to the NICU. Another nurse brought Bearhug over for a quick 1-second hello and then whisked him off to the NICU in a rush. No time for a kiss, barely time for an "I love you" I noticed he was really red, I can't remember if I asked about it out loud or just wondered about it in my mind. The rest of the night is pretty much a blur, I think mostly b/c of the drugs they had me on. I woke up briefly back in my room and heard dh on the phone calling family. Woke up a little later in the night when someone came to ask permission to give BH a blood transfusion. They explained that he and CB had TTTS, twin to twin transfusion syndrome, and that BH's heart was struggling to pump. He had too much blood, and his blood was thick like syrup, so they needed to take some out and replace it with saline (a partial transfusion). They ended up having to do two partial transfusions. And so, their early delivery (6 1/2 weeks early) turned out to be a blessing in disguise. We were told they likely would not have survived much longer had they not been delivered when they were. 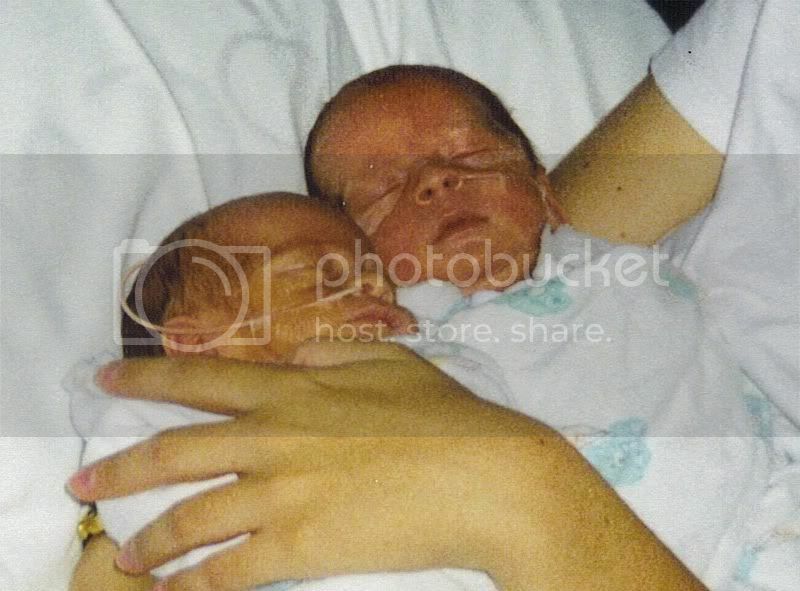 Here are some pictures of the boys, taken by the NICU nurses for me. Cuddlebug (4 lbs, 1 oz., 15 3/4 inches) is at top. Bearhug (5 lbs, 8 oz., 18 inches) is below. TTTS is a disease of the placenta that affects identical twin pregnancies with a shared placenta. The placenta distributes blood and nutrients unevenly between the babies, and/or actually pumps blood out of one and into the other. The donor twin is the baby who is getting less blood/nutrients, they have decreased blood volume which can lead to dehydration, slowed growth, anemia, and insufficient amniotic fluid. The recipient twin becomes overloaded with blood (that's why BH was so red)which creates a risk of heart failure, also leads to swelling and too much amniotic fluid. If not treated, TTTS is fatal in 80-90% of cases. The good news is, there are better treatment options available now, which significantly increases the survival rates. Awareness is essential in order to facilitate detection so that treatment options can be explored. Two professional engineers illustrate the proper care and practical benefits of cats. If you know any cats, or engineers (and even if you don't) this is hilarious. 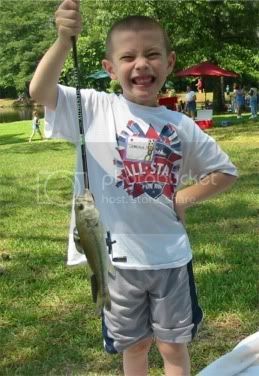 Last weekend we went to a family fishing event for autism families. It's held every year, this was our 3rd time going and we had a great time as always! Cuddlebug caught his first fish! Little Bitty tried fishing too (dh helped), and he also got to see a turtle up close. The turtle swam up to see what all the commotion was about when he splashed in the water. Bearhug spent most of his time bouncing in the bounce house, but he took a short break to have his face painted and get a balloon (shaped like an airplane, cool). No, I'm not going to post a video every day, but I will be posting here and there some videos I think are interesting, funny, or just plain cool. Today's video of the day: Super Karate Monkey Death Car from Newsradio. This show was so funny, and this is my all-time favorite episode, I crack up laughing every time I watch it :). Seven years ago today, I was 33 weeks pg with my twins. I had a regular ob and a neonatal specialist, and I went in to the specialist that morning for a level 2 sonogram to check how the boys were doing. They took my blood pressure and it was something like 160/110. They sent me straight over to the labor and delivery unit (the dr's office was at the hospital) where I was admitted and later that day, diagnosed with severe preeclampsia. They wouldn't even let me go home to pack a bag. Ironically, I had actually attempted to pack my bag the day before figuring we were starting to get close, but was so tired I'd only managed to make a list of what to pack. I had to have dh bring my things. They put me on strict bedrest and said I wouldn't be going home until after the babies were born. In hindsight maybe my body was trying to give us a clue that our babies needed to be delivered early, although we were trying to keep them in the womb as long as possible. As my doctor said, every day they can stay in the womb is 3 days they won't have to spend in the NICU. For the next few days, I started having regular contractions every morning around 4am and was given terbutaline each time to prevent labor. I was on 3 monitors at all times, one for each baby to check their heartrates, and one for me. We managed to bring my bp down a bit, but it was still higher than it should be.